The Patagonia region of Southern Argentina is one of the most remote, desolate and mountainous regions on the planet. Vast steppe-like plains span the land before sharply giving way to craggy peaks of the southern Andes. Even if you were to venture down there today, it's a land frozen in time, a home to rugged gauchos, backpackers and adventurers. It was to this isolated corner of the world that Yvon Chouinard and Doug Tompkins set out to in 1968. They were driven by a sense of wanderlust and a burning desire to climb Mt. Fitz Roy, a monolithic sheer granite peak regarded by many mountaineers as the ultimate summit. The pair hastily set out from Ventura, California with a minivan packed with climbing and surfing equipment. And it was on that 6 month, 5000 mile journey on the Pan American Highway, that both of them began to solidify the notion that great business can also be entities for environmental stewardship. During the sixties, I worked on my equipment in the winter months, spent April through July on the walls of Yosemite, and during the heat of summer headed out for the Alps and the high mountains of Wyoming and Canada—all interspersed with surf trips down to Baja and mainland Mexico. I supported myself by selling homemade gear out of the back of my car, supplementing my meager income by diving into trash cans and redeeming bottles for cash. The gear Chouinard was selling at the time were custom made steel climbing pitols. They were well regarded in the climbing community but the profit margins from them were measly. Nevertheless, in 1971, Chouinard bought an abandoned meatpacking plant in Ventura and began to renovate its old offices as a retail store for outdoor equipment. In addition to the gear needed for technical climbing, Chouinard also started to retail "active clothing." It was an afterthought... a self-made solution to the lack of durable and comfortable climbing clothing. They were just, "knickers and double-seated climbing shorts made from superheavy corduroy produced by an old mill in Lancashire, England." The clothing rapidly became popular with people who appreciated the hand-crafted quality. And then it grew in popularity for it's color, a byproduct of the unique materials which were introduced to meet the needs of it's climber population. This clothing line quickly started to gain traction and it's profits rapidly surpassed those of the climbing equipment which Chouinard had started with. And as homage to his trip, the clothing line was separately branded as "Patagonia". If anything, Patagonia grew slowly. Methodically. But one thing remains a constant - it continuously innovated. Patagonia kept to its roots of helping outdoorsmen and over the years introducing the layered clothing, polyester fabrics and active wear. Today, it earns over $500 million per year in revenue. Oh, and Chouinard's friend Doug Tompkins? He went on to found The Northface. The saying that all great businesses started with a great story might be true indeed. How does the story of Patagonia apply to you? Like you, Chouinard started small. He too had it tough. He once ran a business out of his car and had once survived off of canned cat tuna and ground squirrel (maybe that's not specifically you, but that's pretty rough isn't it?). What made Patagonia persist? Was it the colorful fabrics? Was it the notion of a business with a greater vision? Was it superior quality material? Perhaps. But at the root of it all, everything Chouinard sold was a reply to his target audience's needs. 1) Who is your target buyer? 2) What are their problems or desires? 3) What can you do to help your customers? 4) What's important to them AND you? Find out the problems or coveted desires of your market and ask, "How can I fix this?" or "How can I help?" Believe in your products, but be open to improvement. 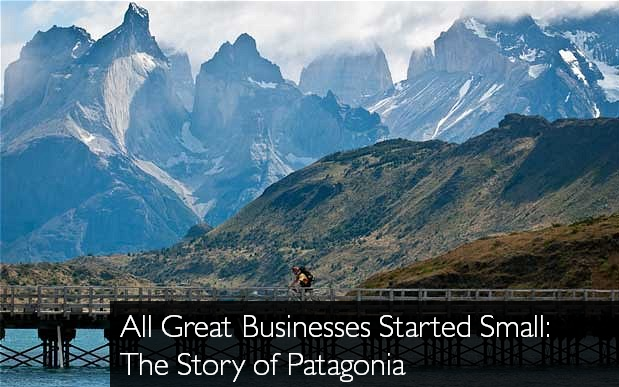 Your small business could blossom into the next Patagonia of your market. It takes hard work, but it's ok to live a little too. Chouinard never forgot to enjoy his life. He surfed and climbed well into his old age and his passion for being outdoors never escaped him in the midst of running his business. Keep your business dynamic and always on the lookout to fulfill your customers' needs. Just know it can't get worse than old cat tuna and boiled squirrel meat. For a more in-depth look at Chouinard and the story of Patagonia, check out the memoir, Let My People Go Surfing: An Education of a Reluctant Businessman.